Industrial plants must meet strict sanitary guidelines in order to remain up-to-code with industry regulations. In these types of environments, there is no room for error and that’s why industrial plants choose to work with the experts at Texas Waste Co.
With same day delivery, your sanitation planning process is quick, easy and stress free. For long-term industrial plant porta potty rentals, we also offer quality and dependable cleaning services to maintain the highest standard for workplace sanitation. 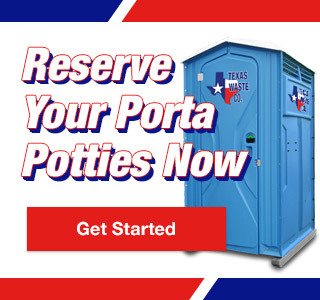 At Texas Waste Co. we know that the condition of your industrial plant porta potty rentals aren’t just about employee satisfaction, but upholding a professional reputation, as well. We share in that goal and have made it our mission to provide companies like yours with the best industrial plant porta potty rentals, sure to keep your employees safe and happy.